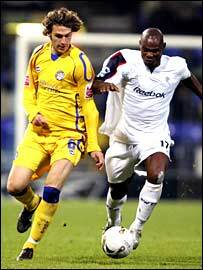 Bolton battled to a 2-1 extra-time win over a tough Leicester side to reach the last eight of the Carling Cup. Substitute Jared Borgetti stabbed home Ivan Campo's free-kick after 104 minutes before Ricardo Vaz Te added a second immediately after the restart. Gareth Williams scored a spectacular strike from 25 yards as Leicester refused to be bowed by Bolton's lead. And Dion Dublin almost equalised in the dying stages but Jussi Jaaskelainen palmed it away to see Bolton through. Bolton boss Sam Allardyce, who has stressed his desire to qualify for Europe by advancing in the cup, sent out a strong team to face the Foxes. Defender Martin Djetou made his first start for the club while Vaz Te and Nicky Hunt were recalled to the line-up. Vaz Te, who also scored a last-gasp strike in last Thursday's Uefa Cup tie, saw an early shot blocked. Bolton dominated the first 25 minutes and Hidetoshi Nakata came close to grabbing an opener, forcing Rab Douglas to palm his strike to safety. But as the half wore on Leicester's confidence grew. Mark de Vries, acting as a lone striker, was dangerous on the break and saw his header from Danny Tiatto's pass skip glance wide. And on the stroke of half-time, Joey Gudjonsson's 30-yard free-kick drifted over the bar. Bolton sent on Campo, returning from a broken foot, after the break and came out with renewed intent. But the home side continued to be frustrated by Leicester's determination - and by their waywardness in front of goal. Ben Haim's free header flew off target while Vaz Te scuffed a left-footed shot wide before slicing a shot over the bar. At the other end Momo Sylla's snap-shot did likewise but despite a late flurry from the Foxes the match had to be settled by extra-time. Borgetti finally broke the deadlock when he got on to a bobbling ball from Campo's free-kick to fire Bolton into the lead from close range. Two minutes later, Vaz Te rounded two players and toe-poked home to send the Trotters 2-0 up. Leicester's resolve did not falter and Williams fired in a scorching strike in the 110th minute. The Foxes pressed forward and Sylla saw another snap-shot go wide before Jaaseklainen denied Dublin with a one-handed save. But it was Bolton who held on to add their name to Saturday's draw. "Jared Borgetti's goal showed what being a scorer is all about and I was pleased for Ricardo Vaz Te. "I didn't want extra-time but I'm glad we got through and we can now look forward to the draw. "It was good to get players back after injury. Nicky Hunt, Ivan Campo and Khalilou Fadiga haven't played much." "We've put on a decent show for our fans. I'm disappointed we're not in the next round. "The first goal was cruel and the second a bit scrappy. "But we're showing signs of improvement and we can take a little bit of confidence from that going into the weekend." Bolton: Jaaskelainen, Hunt, Ben Haim, Jaidi, Gardner, Djetou, Okocha (Fadiga 51), Speed (Campo 45), Nakata, Vaz Te, Davies (Borgetti 83). Subs Not Used: Howarth, N'Gotty. Goals: Borgetti 104, Vaz Te 106. Leicester: Douglas, Stearman (Sheehan 109), Dublin, Johansson, Maybury, Hamill, Williams, Hughes (Sylla 70), Gudjonsson, Tiatto (McCarthy 84), de Vries. Subs Not Used: Kisnorbo, Gerrbrand.